Ovarian cancer is a deadly disease, one that’s hard to detect until it has progressed significantly. More than 75 percent of women diagnosed with ovarian cancer have metastasis at the time of diagnosis, resulting in a low five-year survival rate of less than 30 percent. A large number of studies have shown that an increased body mass index (BMI) is associated with a greater risk for ovarian cancer with worse overall survival. More than 35 percent of women in the United States are obese, putting them at increased risk for the cancer. However, the influence of obesity on ovarian cancer metastasis had not been evaluated. Researchers from the University of Notre Dame and its affiliated Harper Cancer Research Institute (HCRI) unveil important new insights into the relationship between ovarian cancer and obesity. M. Sharon Stack, Ann F. Dunne and Elizabeth Riley Director of the HCRI and professor of chemistry and biochemistry, notes that ovarian cancer is the leading cause of death from gynecologic malignancy in the U.S. The researchers set out to determine whether obesity contributes to ovarian cancer metastatic success. In other words, are tumor cells better able to successfully metastasize when the “host” is obese versus lean? 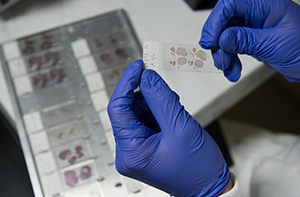 Individual organs were removed from the mice and imaged to quantify tumor burden in each organ. Researchers also used another mouse model of obesity, termed the ob/ob mouse, which harbored a mutation that caused it to become highly obese. “In all of these models, we found that obesity enhances ovarian cancer metastatic success,” Stack said. The researchers hope that further research in this direction may provide new targets for dietary and therapeutic interventions to slow or inhibit metastatic dissemination and thereby impact the long-term survival of women with ovarian cancer. However, Stack pointed out that they are just at the beginning of understanding this complex disease. The study was supported by grants from the National Cancer Institute and the Leo and Ann Albert Charitable Trust and by training fellowships from the National Cancer Institute and the National Science Foundation. Stack also noted that the interdisciplinary nature of the research. The study appears in the journal Cancer Research and can be found here: cancerres.aacrjournals.org/content/75/23/5046.abstract?sid=91fcbe62-1a33-4009-980c-73df6379199a.